The retailer is cutting hundreds of jobs, but it isn't giving up on growth. After growing sales by more than 50% between 2010 and 2015, upscale retailer Nordstrom (NYSE:JWN) saw a sharp slowdown in sales gains starting last summer. 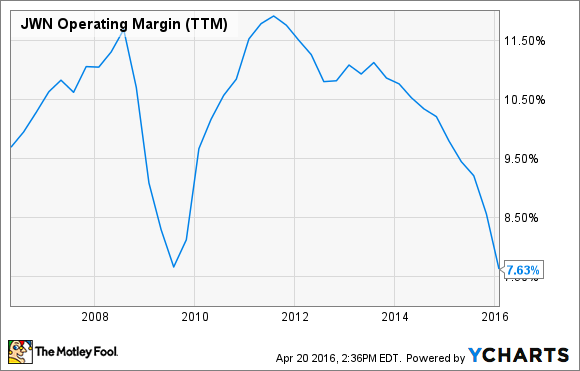 Meanwhile, rising costs from various growth initiatives have driven its operating margin down to levels not seen since the Great Recession. JWN Operating Margin (TTM), data by YCharts. To address these issues, Nordstrom is turning to cost cuts. In doing so, it's following the lead of department store peers like Macy's (NYSE:M) that are facing even bigger sales slumps. Still, Nordstrom isn't in as much trouble as many investors and pundits seem to think. During the first half of fiscal 2015, Nordstrom posted revenue growth of 9.5%. Rapid expansion of the Nordstrom Rack off-price chain, strong e-commerce growth, and the opening of Nordstrom's first two stores in Canada all contributed to this great result. Sales growth decelerated sharply in the second half of the year, with comp sales turning negative for physical stores. Yet even in Q4 -- when Nordstrom turned in its worst sales performance of the year -- total sales rose 5.2%, driven by higher online sales and new stores. That stands in sharp contrast to the situation at Macy's. Sales fell in every single quarter of fiscal 2015 at Macy's, with the pace of revenue declines accelerating as the year progressed. For the full year, sales dropped 3.7%. Macy's expects the sales declines to continue in fiscal 2016, but hopes to return to modest sales growth by the following year. Given this gloomy forecast, it's not surprising that Macy's has needed to take a hatchet to its cost structure. The company plans to close dozens of stores and cut thousands of jobs this year in a bid to reduce costs by $400 million annually. Nordstrom's problems are comparatively mild. Sales aren't declining, but the company is seeing a growing customer preference for shopping online. Additionally, the rapid expansion of its Nordstrom Rack chain may be diluting comp sales growth for that segment. Nordstrom has opened dozens of Rack off-price stores in recent years. Accordingly, Nordstrom told investors in February that it would make some targeted cost cuts this year. It aims to reduce overhead expenses while continuing to invest in its key priorities. In March, the company laid off about 7% of its tech staff, roughly 120 workers. Earlier this week, it announced plans to eliminate another 350-400 positions in its corporate headquarters and regional offices. Nordstrom is also pivoting to a greater focus on profitability over pure growth in its e-commerce business. This could include removing some items that weren't profitable to sell online due to shipping costs. Despite cutting several hundred positions and moderating its investments in some areas, Nordstrom still expects to post steady sales growth going forward. It hopes to reach $20 billion in annual sales by 2020, which would be up 42% relative to 2015. Getting there doesn't count on achieving a big turnaround in comparable-store sales. Nordstrom expects sales at its existing full-line stores to be roughly flat or even down slightly. But the Nordstrom Rack chain will continue to grow, reaching about 300 stores by 2020, up from 194 at the end of 2015. Nordstrom's move into Canada will deliver hundreds of millions of dollars of incremental sales. A new flagship store in Manhattan scheduled to open in 2019 could produce $300 million-$400 million in annual revenue. And the Trunk Club concierge shopping service has posted explosive growth. Nordstrom's new Manhattan flagship store could produce stellar sales. Image source: Nordstrom. Most importantly, Nordstrom expects online sales to continue surging. Nordstrom quadrupled its online sales from $705 million to more than $2.8 billion between fiscal 2010 and fiscal 2015. It will probably add billions of dollars to that total in the next five years. To support this growth, it opened a new fulfillment center in Pennsylvania last year and it is finalizing plans for another in California. Thus, pundits who have portrayed Nordstrom's job cuts as a sign of doom are blowing things out of proportion. Expenses have risen faster than sales at Nordstrom in recent years as the company has invested heavily in growth initiatives. All Nordstrom is doing now is acting to reduce future cost creep so that sales gains over the next five years can drive strong profit growth.